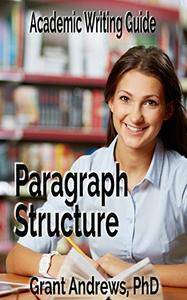 Everything you need to know about the structure of a paragraph is contained in this short guide. An outline of the different sections you'll need to include is provided, and each section is explained in detail so that you know exactly what you'll have to do to succeed in your essay or dissertation. Learn how to write a good topic sentence, how to provide evidence or support for your ideas, and how to explain your evidence using your critical thinking skills. This guide will be useful for making sure that you start off your journey of academic writing on the right foot. It will cover all of the basic elements, and will take 30 minutes to work through. The guide is written by Dr. Grant Andrews, who has been teaching academic writing for years, and who knows the common pitfalls that students experience in academic writing. This book is part of the Essay and Thesis Writing Series.